people in a major onslaught against the Shiites in the 1980s. "I can't just say yes or no to this. You read all this for the sake of public consumption, and I can't answer it in brief," Hussein replied. "This will never shake one hair of my head". 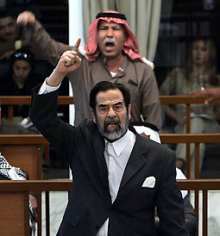 This was just the beginning, as the former dictator went on with another of his usual ramblings, saying that he is still the president of Iraq, according to the will of the people, while Rahman was entering the "not guilty" plea on behalf of Saddam. The Dujail crackdown has been going on as an important part of the trial brought against Saddam and seven of the former members of his regime, for seven months now and the charges officially made today represent a signal that the trial is finally making some progress. During the Dujail incident in 1982, residents and entire families were arrested by security forces in what has been called an assassination attempt of Saddam Hussein. © 2001 - 2007 Softpedia. All rights reserved.